Is been almost 3 months I did not make a post on my blog. Not that anyone would really care though…LOL. I’ve been busy on working some projects for clients and did not find the time to travel as much as I would like. I’m still in the Philippines and hope to get back into making more posts. 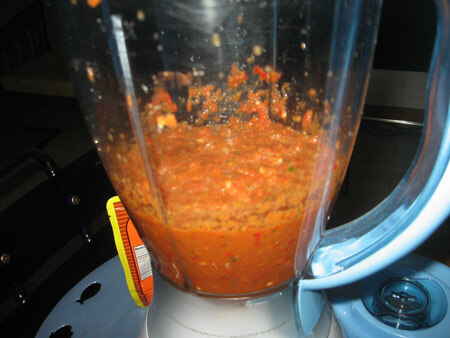 So here is a post on how to make “Sambal Belacan”. 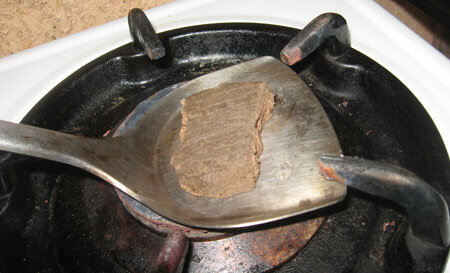 Is a kind of spicy dip similar to Thai’s version of spicy dip call “Namprik”. 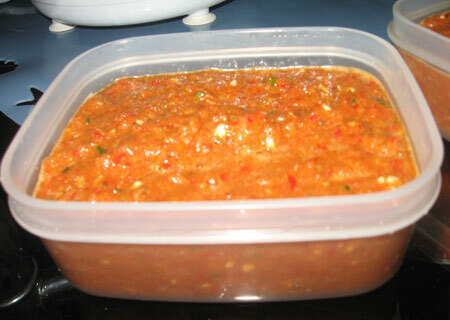 Sambal Belacan is mostly popular in Singapore and Malaysia among the Malays. The Malays usually eat Sambal Belacan with fried chicken, fish, seafood and raw vegetables. For those who are not used to eating spicy food, Sambal Belacan might look like food for crazy people. In Malaysia and Singapore, this dip is almost like a must have. When I was in the midst of preparing this dip, I can’t help but to imagine who actually invented it. It really amazes me that the person whom invented this dip had the idea to mix all these ingredients. 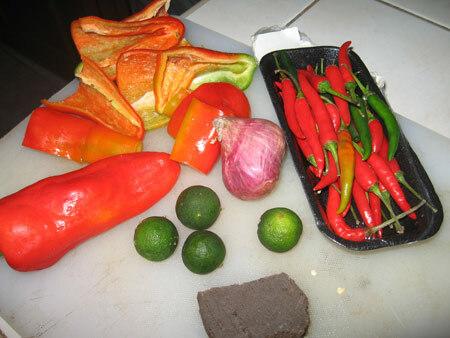 I am sure a lot of trial and error were involved to whip out the best tasting sambal belacan. It has all the flavors that a human tongue can taste. Sourish from the kalamansi, spiciness from the chili, salt, sugar and belacan taste I can’t even really describe. In my own words, belacan smells like CRAP but taste like heaven. I have no idea why such food is loved by most Asian. In honesty, it does smell like socks that has been worn for 14 straight days. Despite my description of how scary the smell of belacan, this dip is really a favorite among many Asians who are into spicy food. Is always good to have sambal belacan stored in the fridge. Comes in handy when you are just too lazy to cook or dunno what to eat. Just fry an omelet and serve it together with sliced cucumber or lettuce. I can bet you it will turn that simple meal into a really good one. Fried chicken and fish with turmeric is also a good with sambal belacan. Basically you can eat it with almost anything. It sure makes eating Chow King’s blend pancit and fried rice a whole lot better. Belacan is that nam prik kapi tasting (or resembling) stuff right? 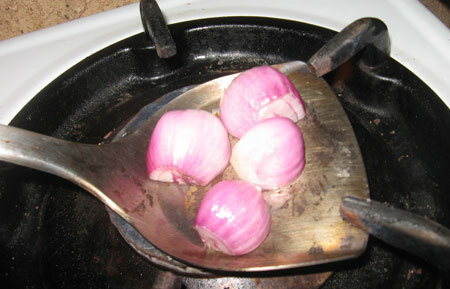 I recently learnt to make sambal belacan from my Indonesian maid. 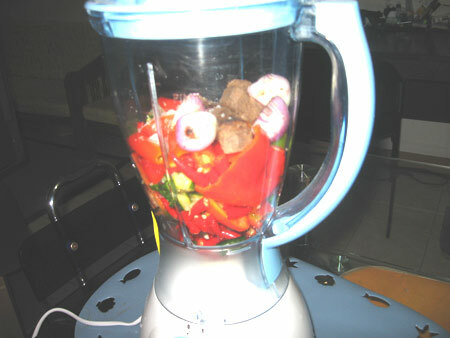 Her version is very similar to yours, except that she didn’t use kalamansi, and added some tomatoes in the mix. i’m not into spicy food, not that much really; but the way you present this post makes me think twice to try the dip whenever possible, haha! hello, alex! how are you? we met in a restaurant opening event where bloggers were invited, king chef to be exact in banaue, manila. i and my family are now (for the time being) based in penang. You should try it Doc…..dip it with fried chicken with turmeric…! It will surely turn you into spicy food fan!